Las Vegas is regarded as a city where dreams come true, but there is much more to Vegas life than sticking, twisting and getting married. No matter whether you are heading to Sin City on your own, with a partner or with the family, there are plenty of activities on offer in this great city; make sure you have your itinerary planned and tickets ready for visiting the best Las Vegas attractions below! Any holiday to Las Vegas must consist of a visit to The Strip. Technically The Strip refers to the area of Las Vegas Boulevard between Sahara Avenue to the north and Russell Road to the south, but now The Strip refers to the array of hotels and casinos on or near Las Vegas Boulevard. 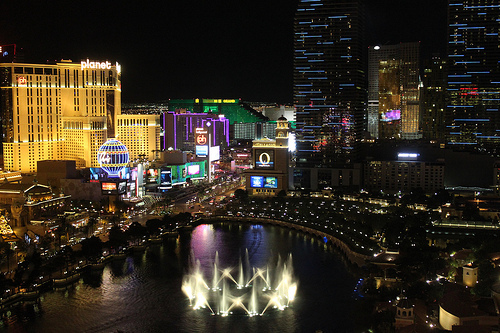 The Strip is where you will find the most iconic landmarks in the city, such as The Venetian’s Grand Canal, the Bellagio Fountains, The Luxor’s pyramid and sphinx, and the Eiffel Tower at Paris, Las Vegas. Many holidaymakers decide to walk The Strip, but there is a Monorail and buses that offer rides from one end of the strip to the other 24/7. If you are looking for a really spectacular way of seeing The Strip, then there are Las Vegas Strip Highlights helicopter tours available. The Grand Canyon National Park is just a short distance away from Las Vegas, which is why Vegas is a popular base for holidaymakers looking to explore the Grand Canyon. One of the most popular ways to see the Grand Canyon is via a helicopter tour as you get to see this amazing example of natural beauty from above, as well as fly over the Hoover Dam. Many helicopter tours touch down so that visitors can explore the Native American Hualapai lands and get an up-close look at the Colorado River. A visit to the Bellagio Casino and Fountains is a must as not only can you lay your money on the line in table games and slot machines, but you can see a spectacular light and water show every 15-30 minutes, depending on what time of day you’re strolling past. Almost every movie based in Vegas features the Bellagio Fountains; think back to Ocean’s Eleven when at the end of the movie the likes of George Clooney and Brad Pitt meet up at the fountains to say goodbye to each other and go their separate ways. You can see some of the most well-known landmarks across the world in one place as Las Vegas is renowned for replicating the likes of Egypt’s pyramids and France’s Eiffel Tower. The Venetian Casino and Grand Canal is one of the most ambitious, replicating the highlights of Venice. Visitors can go on gondola rides along the Grand Canal and marvel at singers, stilt walkers and living statues – all of which are common sights in the real Venice. Venetian Casino and Grand Canal also has a small branch of the Guggenheim Museum and Madame Tussauds inside of it. The Hoover Dam is another great option for a day out and is visited by millions of holidaymakers every year. The dam is 30 miles away from Vegas and the historic attraction, which was built in the 1930s, separates Nevada and Arizona. There are tours available for visitors who want to find out more about this famous landmark too. There are so many things to see as well as activities to do that will be perfect for the whole family. The Bellagio Fountains is so famous, and with good reason. The Grand Canal is also a wonderful place to visit in Las Vegas, and riding the gondola along the canal can make you feel as if you’re in Venice, enjoying the very same experience. Thanks for sharing these places, there’s always so many things to do in Las Vegas.